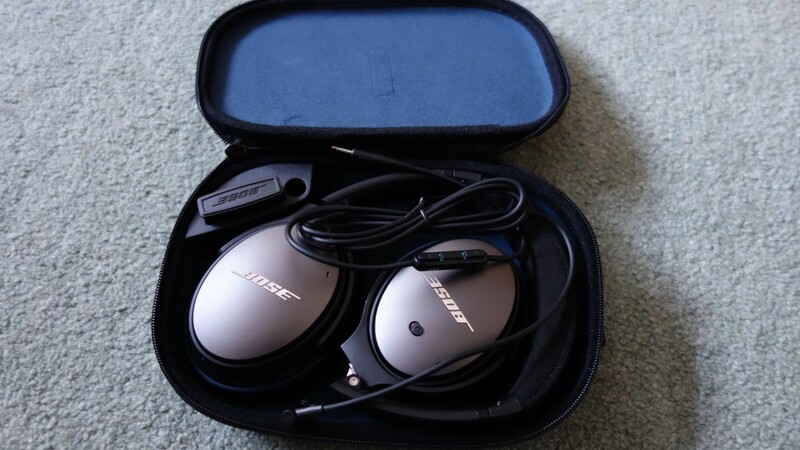 Bose has long been recognised as a company that has both produced very stylish headphones/speaker systems, but not always had the backing of real audio lovers. I have to say I've never spent anything over £100 of my own money on headphones so I'm very interested to see what kind of audio quality the QuietComfort 25 can deliver to justify their £269 price tag. I love music and my range of genres is very mixed so I’m able to test out a range of different sounds. Not only that, I wanted to see how the Bose QuiteComfort 25’s perform in games too. Unboxing the Bose QuietComfort 25’s you can tell these are expensive. The box is small and neat and the headphones themselves were packed into a very good looking and compact case. There is enough room in the case to contain the headphones, in-line remote and mic, airline adapter and a compartment for an additional AAA battery (needed for the noise cancelling system). Taking the headphones out of the case the main ear cups fold out so they can be placed over your head. I know it is a simple thing, but even the folding mechanism of the headphones felt very well thought of, there was no locking up or tenseness to them at all. Another really good and simple feature is that inside the earcups there are very large printed R and L for left and right ears – simple but prevents flapping around working out which cup goes where.